Just worked on this brake bleed for a customer who complained of his hydraulic disc brakes being too ‘spongey’ whilst depressing the lever. After through investigation by our mechanics, we discovered that there was a massive amount of air-pockets that were hiding within the hose, callipers, and brake lever reservoir. Sounds like you? 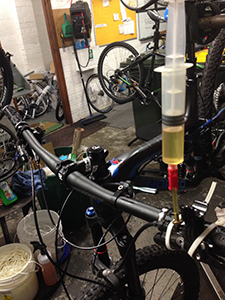 Time to book your bike in for a service and we will get it sorted for you!